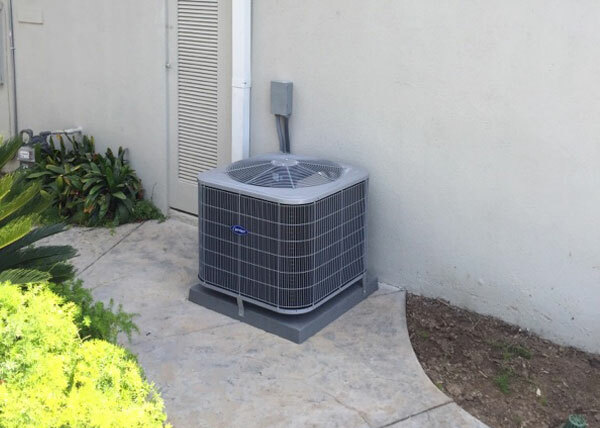 Anacapa Heating & Air is a full-service heating and air conditioning company that provides Montecito residential and commercial clients with exceptional HVAC services at fair and affordable rates. All of our heating and air conditioning repairs, installations and tune-ups are provided by highly experienced HVAC technicians who are factory trained and NATE certified. Because of their extensive knowledge of heating and air conditioning systems and well-developed skills in applying the industry's best practices, our technicians can be counted on to complete each job according to the highest of standards. As a testament to the quality of our work and customer service, we have over 20,000 satisfied customers and receive the majority of our business from returning customers and referrals. 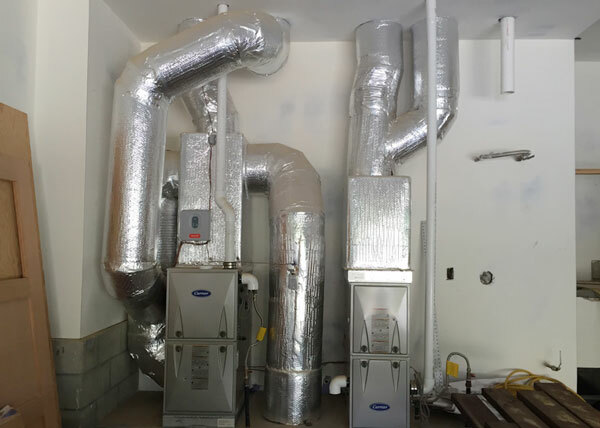 Anacapa Heating & Air also provides a full range of mechanical contractor services for Montecito's commercial and industrial clients. Click here to learn more. 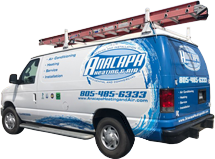 Anacapa Heating & Air is proud to be a family owned and operated heating and air conditioning company that has served the Montecito area since 1998. We're fully licensed and insured, and members of IHACI (Institute of Heating and Air Conditioning Industries), the Building Trades Association, and the Ventura Contractors Association. Our normal business hours are 8am to 5pm, Monday through Friday, but we are also on-call 7 days a week to help handle heating and air conditioning repair emergencies anywhere in or near the Montecito area. Call us today to tell us about your heating and cooling needs. We provide free in-home/on-site consultations for new furnace and air conditioner installations, low-cost tune-ups and service calls, and custom-tailored Preventative Maintenance Club memberships. When it comes to installing a new furnace or air conditioner, who you choose to install your HVAC system be just as important as -- if not more important than -- what you choose to install. That's because it is typically your HVAC company who not only recommends which equipment will best fit your property and match your indoor comfort preferences, but also ensures that your equipment is correctly installed and supported by well designed and thoroughly sealed ductwork, which together determined how well your central heating and air conditioning system functions overall. If you want to feel confident that you are getting the ideal heating and/or cooling solution for your home or business in Montecito, call Anacapa Heating & Air. As a Carrier Factory Authorized Dealer, you can rest assured that we'll give you a high-performance system that is perfectly suited for your indoor comfort needs. That's because every furnace or air conditioner installation starts with an in-depth on-site consultation with an experienced, NATE-certified technician. During this consultation, our expert looks at your pre-existing HVAC equipment and ductwork, evaluates your energy bills, and discusses your heating and cooling preferences and goals with you. Only after we have a complete picture of your expectations, needs and budget, do we provide you with personalized recommendations. Since we are committed to giving our Montecito customers excellent comfort and the best value, we exclusively sell Carrier furnaces and air conditioners. Carrier offers three product lines so that we can accommodate nearly every type of customer, from those interested in finding the most cost-effective solution to those seeking top-of-the-line heating and cooling equipment with maximum energy efficiency and innovative, state-of-the-art technology. No matter which Carrier system you choose, your new furnace or air conditioner will be backed by a 100% customer satisfaction for one full year, when installed by a Carrier Factory Authorized Dealer like Anacapa Heating & Air. Moreover, most Carrier heating and air conditioning systems are further protected by a 10 year warranty. Call us today to learn more. For reliable heater and air conditioner repairs, give Anacapa Heating & Air a call. Whether your air conditioner just went out or your furnace's pilot light won't light, our technicians will know how to troubleshoot, diagnose, and repair the issue. We charge $69 for heater or air conditioner service calls in the Montecito area. This charge includes having one of our NATE-certified technicians come out to your home or business and perform a thorough inspection of your system in order to diagnose the underlying problem and provide a quote for repairs. This $69 fee can be applied toward the cost of your repair if you choose to approve the work. We provide accurate diagnostics and expert repairs on all major furnace and AC brands, including but not limited to Carrier, Bryant, Day & Night, Trane, Rheem, Goodman, Honeywell, Lennox, Payne, York, and American Standard, and use affordable, flat-book pricing. Additionally, because we keep our service vehicles well stocked, we're able to complete most repairs on the first visit. Call today to schedule your air conditioner or furnace repair in Montecito. We will provide a two-hour appointment window so that you'll have a good idea of when our technician will show up. If it looks like our tech will be late, we'll give you a call ahead of time to let you know. If you're in need of emergency repairs, we will do our best to dispatch a technician out to your home or office as soon as we can. Since we know how critical it can be for customers to have a working air conditioner or heater, we have service techs on call 7 days a week to respond to emergency requests. Preventative maintenance is important for heaters and air conditioners of any age. When it comes to newer models, a tune-up helps to ensure that you are meeting the warranty conditions for normal care and maintenance. For older heating and air conditioning systems, we encourage an annual tune-up to keep it running at optimal functionality. In all cases, regular maintenance helps manage your energy usage, catch potential problems early, and avoid performance and safety issues. At Anacapa Heating & Air our HVAC maintenance visits are just $79 and include a comprehensive inspection, cleaning, and tune-up. While maintenance visits can be scheduled at any time of the year, we typically recommend that our customers schedule their air conditioning tune-ups in the spring and furnace tune-ups in the fall -- well before they are expected to be used the most. Call us today to book your HVAC maintenance visit in or near Montecito, California. We provide tune-ups on all makes and models of furnaces, air conditioners, heat pumps, and mini-splits. We provide free estimates on all new installations and replacements, as well as upfront, affordable flat-book pricing on any of our repairs. Our team is invested in building long-term clients and can always be counted on to deliver expert, honest advice, high-quality workmanship, and proactive customer service. Call us today to tell us about your needs.